Drawing of ASME B16.5 Class 300 weld neck flange, raised face(RF). Drawing of ASME B16.5 Class 300 blind flange, raised face(RF). Drawing of ASME B16.5 Class 300 slip on flange, raised face(RF). 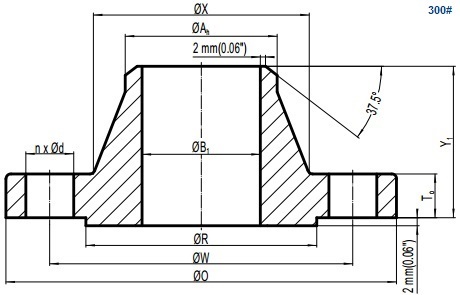 Drawing of ASME B16.5 Class 300 socket welding flange, raised face(RF). Drawing of ASME B16.5 Class 300 threaded flange, raised face(RF). Drawing of ASME B16.5 Class 300 lap joint flange. All dimensions are provided in both mm and inch units. The two unit system shall be used respectively and exclusively. The bolting of Class 300 flanges can be furnished by stud bolt with nuts or machine bolt with nuts. Stud bolts can be used for RF or RTJ end facing while machine bolts are only used for RF facing. Dimensions of ASME B16.5 Class 300 flanges in below tables shall be furnished with RF facing. For other facings, please contact us for detailed specification. The same as Class 150, the Class 300 flange has a 2 mm(0.06 inch) raised face which is additional to the minimum flange-thickness. *X:diameter at hub; Ah:hub diameter at the beginning of chamfer for W/N; ro: corner bore radius of lapped flange; Do:depth of socket. *Y1:length through hub of welding neck flange; Y2:length through hub of threaded, S/O and S/W flange; Y3:length through hub of lapped flange. *Ta:minimum thread length of threaded flange; B1:bore diameter of welding neck flange or lower part of socket welding flange. *B2:bore diameter of slip on flange or upper part of socket welding flange; B3:bore diameter of lap joint(lapped) flange. *LSRF:length of stud bolts for raised face; LSRTJ:length of stud bolts for ring joint; LMRF:length of machine bolts for raised face. Stud bolt with nuts & machine bolt with nuts for ASME B16.5 Class 300 flanges.